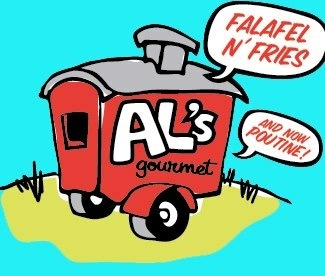 Al’s Gourmet Falafel and Fries is a gourmet food cart serving up the freshest and tastiest ingredients from our Monday to Friday location one block up Rainbow Rd from the Ganges Marina. Specializing in gluten-free organic falafel wraps and salads, we also serve up fresh cut fries, real yam fries, real Québécois Poutine and our Southwestern Chicken Kebab Pita Wraps with candied jalapeños and chipotle mayo- YUM!! Come find us weekdays on Rainbow Road and at the Saturday Market.